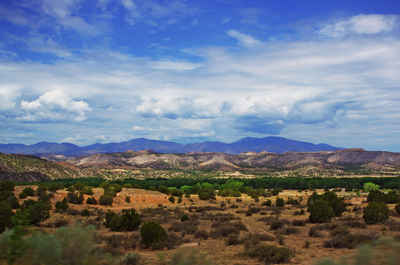 The Cumbres & Toltec Railroad was named the New Mexico's official State Historic Railroad in 2005. This railroad, built in the 1880's, runs the 64 miles between Chama, New Mexico and Antonito, Colorado over gorgeous mountainous terrain, thru tunnels and on high narrow trestles as a tourist attraction for both states. The steam engine locomotives and preserved cars have changed little since their early days as the Denver and Rio Grande narrow gauge line and are known as "America's longest and highest narrow-gauge steam railroad." Making the trip all the way between the two points or getting off midway at the top of the mountain in Osier and returning back by bus to your departure point gives one an opportunity to travel back in time to the early days of the twentieth century. These trips run daily from late May to mid October with special trips now offered in the winter. It has been said, "The West has to be seen to be believed. 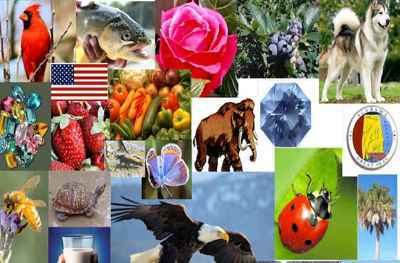 But it has to be believed to be seen." - Kiowa poet N. Scott Momaday. The same could be said about the Cumbres & Toltec. 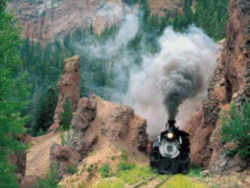 America's most authentic steam-operated railroad, the Cumbres & Toltec, is a proud remnant of the spirit that won the West. In recognition for its place in our national history it was awarded National Historic Landmark Designation in 2013. Built in 1880, it was part of the San Juan Extension of the Denver & Rio Grande Railroad, with tracks running from Denver through the ore-rich Rocky Mountains to Silverton, Colorado and Santa Fe, New Mexico. Its path through steep passes and deep gorges is the stuff of adventure novels and was an engineering feat for the time. The decline of silver mining in the 1890s ended the railroad's vital role. The Denver & Rio Grande Railroad filed for abandoment in 1969, but the most scenic part of its route, its equipment, and its buildings were saved by the states of Colorado and New Mexico. Today the Cumbres & Toltec Scenic Railroad fulfills another important mission - taking passengers on the ride of a lifetime, connecting Colorado and New Mexico, the Mountains of the San Juans to the Conejos Valley, and allowing us to see where the deer and the antelope play.. 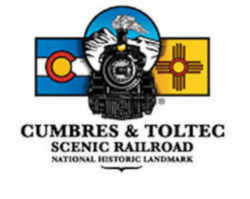 The law designating the Cumbres and Toltec scenic railroad as the official New Mexico state historic railroad is found in the 2013 New Mexico Statutes, Article 3, Section 12-4-4 S.